Hi everyone! Since we're jumping into the new Season 6, I'm going to do a quick update on this page to make sure you guys have the latest scoop on what to use for the ranked season. Thunderlord's Decree has grown tremendously in popularity since the Season 6 masteries were first released, and Grasp of the Undying rose to replace Bond of Stone for the majority of tanky laners. Anyway, let's dive right in. Patch 6.8 Update: Thunderlord's Decree is still a popular mastery, but Fervor and Deathfire Touch are starting to be highly favored for sustained damage dealers. The majority of marksman take fervor now. 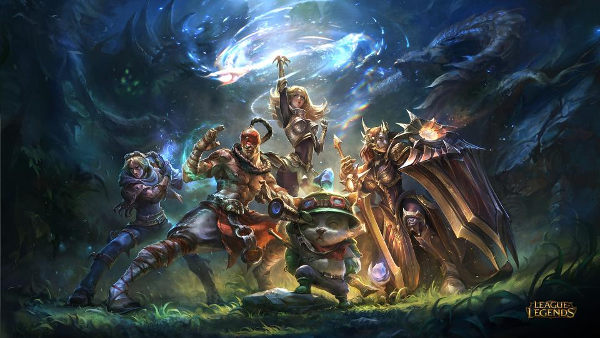 Patch 6.2 Update: Thunderlord's Decree has grown tremendously in popularity since the Season 6 masteries were first released, and Grasp of the Undying rose to replace Bond of Stone for the majority of tanky laners. As the champion class with the most changes this time around, I thought it best to start with these. You'll definitely want to start with the offensive (red) tree first as your main job is to dish out the big crits. The new standard marksman set-up. Some people still run Thunderlord's Decree or even rarer Warlord's Bloodlust, but otherwise almost everyone picks up Fervor now, including burst champions like Ezreal and Lucian. The only exception is Graves, who almost always gets Warlord's Bloodlust as a result of its strong synergy with Death's Dance (item). Fury vs Sorcery: Obvious choice for Marksmen. Go Fury. Double-Edged Sword vs Feast: For Marksmen, you'll likely want to pick up Feast over Double-Edged Sword. Feast gives you extra early game sustain, whereas Double-Edged Sword won't be useful until late game where staying alive is more important than a bit of extra damage. On the other hand, if you're just looking to do as much damage as possible and are confident, feel free to get sword. Vampirism vs Natural Talent: These are both lackluster early game, but Vampirism offers a tiny bit more survivability late game for relatively little in the way of damage sacrifice. Lifesteal is affected by armor, so ignoring that, the stat efficiency actually leans a little more towards Natural Talent between two equal HP champions. 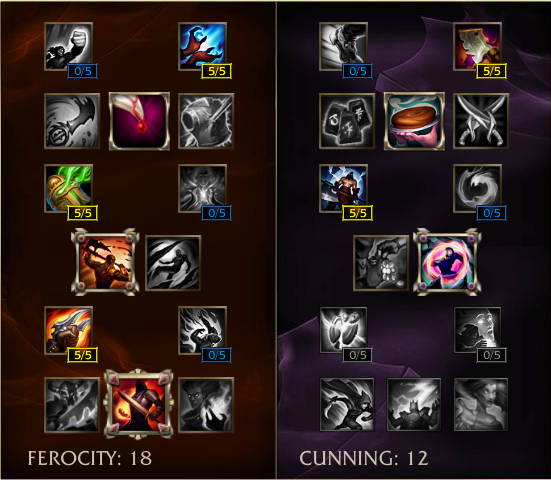 That being said, Vampirism still seems the better selection based on late game marksman needs. Bounty Hunter vs Oppressor: Bounty Hunter is the clear winner in this case for the majority of scenarios. 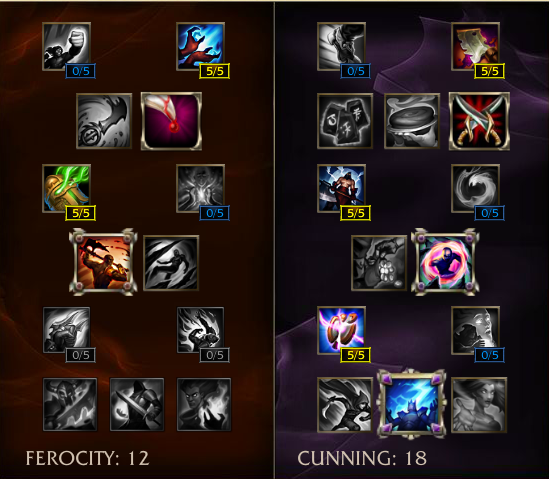 A high CC type champion like Ashe will find Oppressor more useful during early to mid game, but its uses are still limited. Most marksmen will elect Cunning over Resolve. 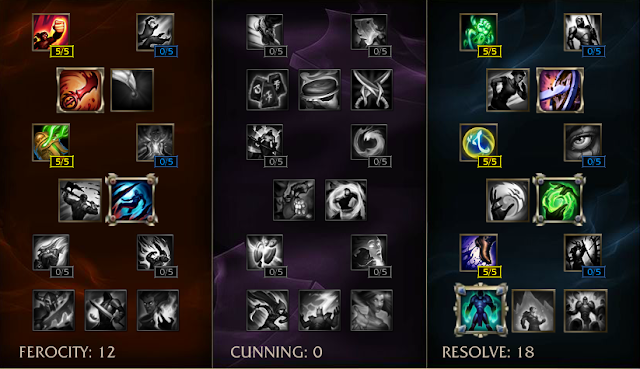 Resolve is better on champions that build defensive items, whereas Cunning gives more immediate benefits. Wanderer vs Savagery: Proactive players will want Wanderer, whereas most others will want Savagery. Wanderer also only works when out of combat, so it's not as useful unless your CS is perfect. Runic Affinity vs Secret Stash vs Asassin: The Secret Stash mastery grants you biscuits which will be better early game, and the Runic Affinity extends your red buff, which is better mid to late game. This one could swing either way depending on your personal style. Few players will get assassin, as marksman are rarely alone. Merciless vs Meditation: Merciless FOR SURE. Bandit vs Dangerous Game: Most players now go Dangerous Game as the gold generation from Bandit is generally considered too slow and for supports only. 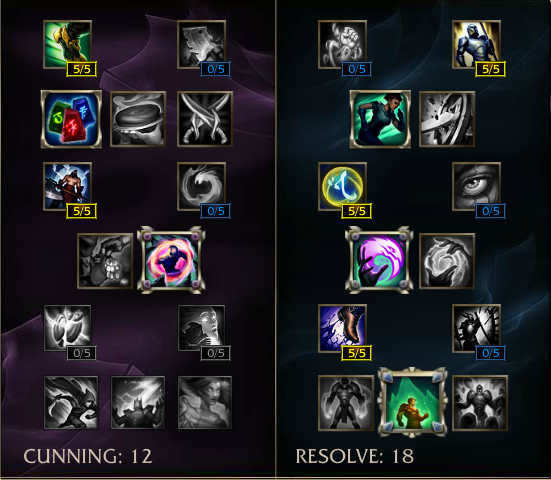 Precision vs Intelligence: Precision is much better, even on cooldown reliant champions like Blue Ezreal. In the mid lane, Thunderlord's Decree is still very popular amongst the burst casters and assassins. However, some sustained damage dealers are going back to Deathfire Touch for the increased damage over time. 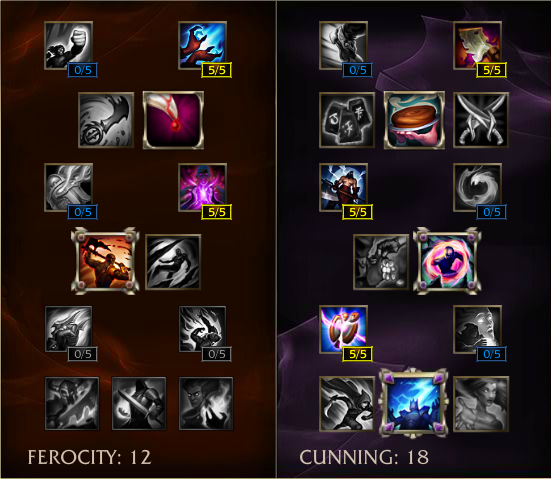 For AD based mid laners such as Zed or Talon, the mastery page ends up looking very similar, except that you may swap from biscuits to the Assassin mastery. For sustained damage dealers like Malzahar and Brand, players generally choose to pick up the DFT mastery instead as it offers more damage over time and also a stronger late game via percentage magic penetration. 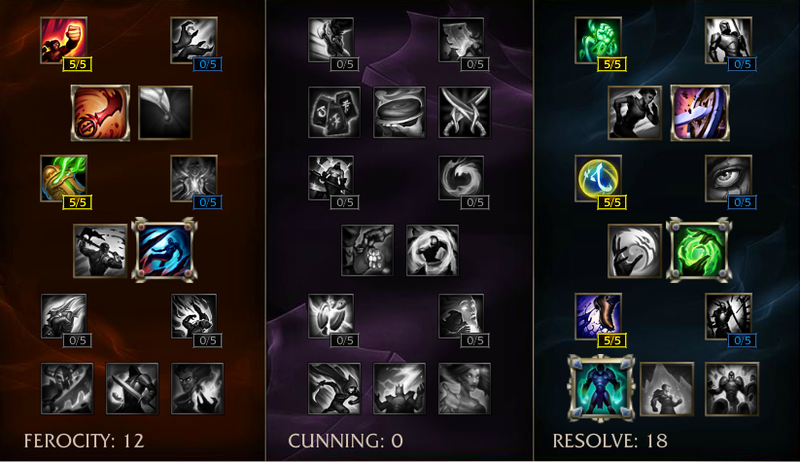 As you can see from the below, most AP supports can run a very similar page as AP casters, but swap Dangerous Game for Greed. and the minion masteries to the other side. You may also want to pick up Oppressor over Bounty Hunter in order to maximize your early game trades as most supports don't scale strongly into the late game. 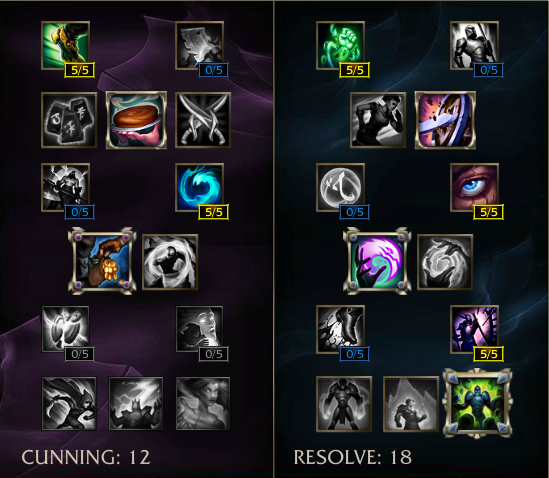 Supports like Soraka, Janna, and even Alistar benefit greatly from the set-up below. Windspeaker's Blessing grants a massive resistance buff to all allies healed or shielded, Meanwhile, Runic Armor in the resolve tree also gives you an excellent boost on heal. 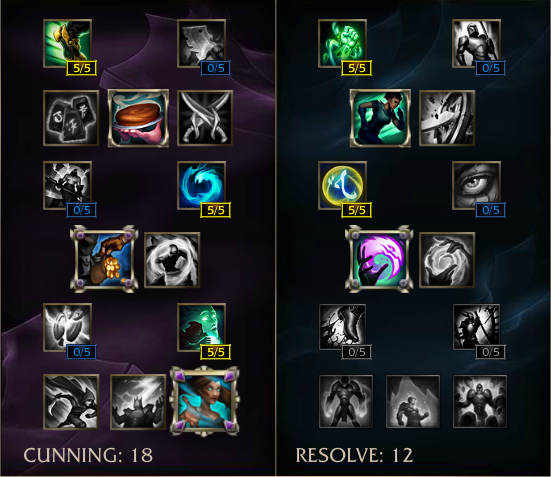 If you're specifically playing Alistar however, I'd swap out the first tier Resolve "Recovery" mastery with "Unyielding" since his in-lane heal is already very good. The mastery choice in this case is "Grasp of the Undying" vs "Bond of Stone". Grasp deals more damage, but I prefer Bond of Stone to help reduce damage all around. As some people pointed out, Alistar players that work more more off the tanky aspect of him tend to go with the setup below. For tank junglers, most players opt to pick up the Strength of the Ages keystone mastery after the nerfs to Grasp of the Undying. It provides decent scaling and works well with the majority of champions that are more there for the utility and already have a decent amount of sustain. Since I left this one off the list last time, I figured this would be a good opportunity to add it on this time around. As you probably guessed, Thunderlord's Decree is again the keystone of choice as the majority of AP junglers are burst damage based. Meanwhile, some sustained AP damage junglers may go Deathfire Touch, but there aren't many and most champions that fit that category tend to use a defensive keystone instead. Top lane has mostly settled down to keystone masteries that generally either revolve around the tank based Grasp of the Undying or again, a burst damage Thunderlord variation depending on if they're AD or AP (same masteries as mid lane). 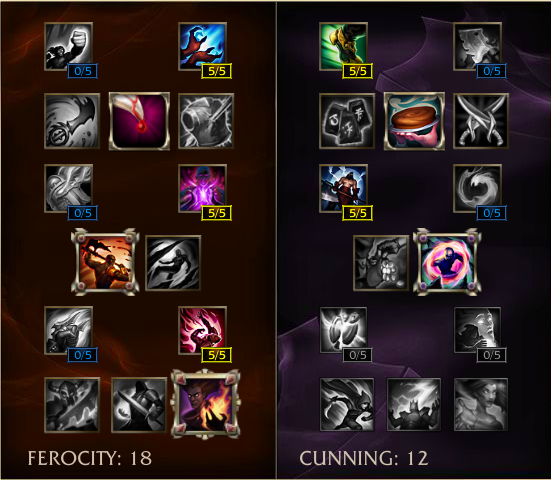 At the moment, there's a fairly balanced spread of mastery selections. Some people like to mess around with Stormraider's Surge on champions like Zilean or Talon, but generally it's more of a pubstomp type of keystone that most try and avoid. 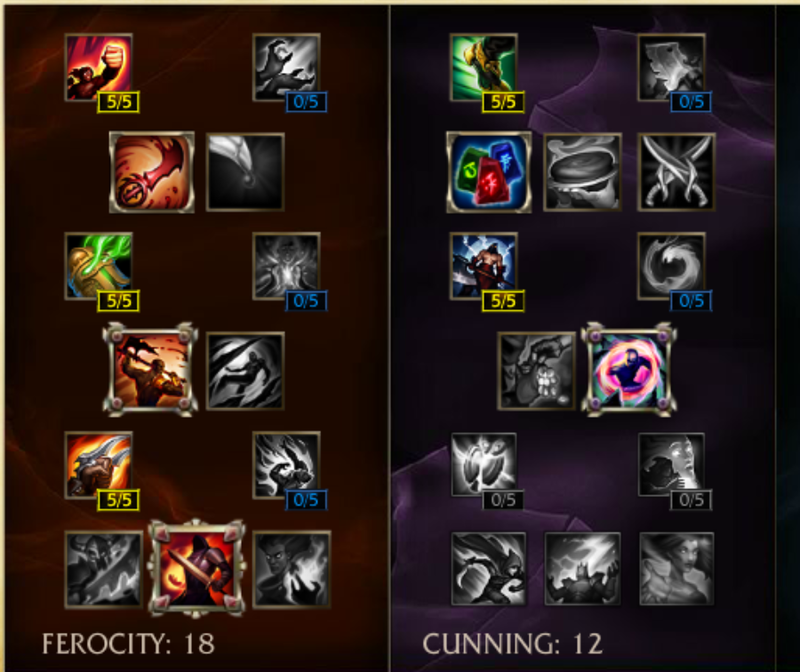 Think there's another set of popular masteries that I missed above? Comment below!